We were inspired to create “Pasichnyy” and apartments of new generation by the best examples of European architecture in London, Krakow, Warsaw and Vienna. Being the largest new residential complex of comfort class in Lviv “Pasichnyy” is a fresh extraordinary approach to the construction and architecture and absolutely new concept for Lviv. We are erecting about 20 dissimilar multi-storey buildings with residential area of 200, 000 sq.m. on territory of 14 ha near the forest. Well-developed infrastructure of “Pasichnyy” is a major advantage of the modern megapolis for its residents: parkland, fresh air, silence and ecological properties of the complex. Apartments of the new generation are thoroughly planned in European style and new constructions itself have courtyards and leisure areas which are combined by common territory and developed infrastructure. Your apartment in “Pasichnyy” is not only a modern and convenient house but also a comfortable surrounding for living. 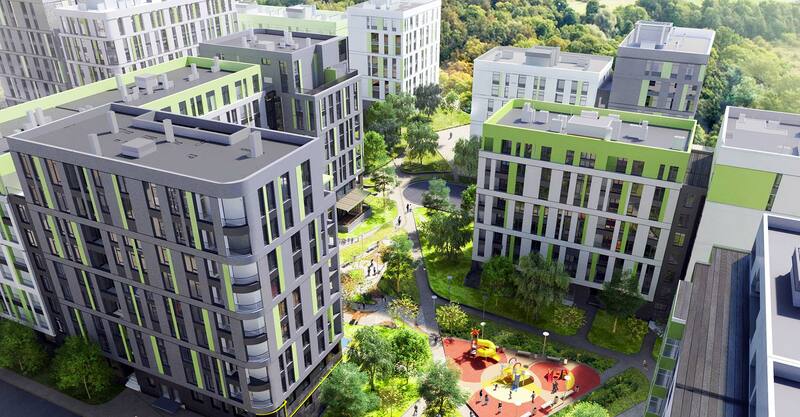 “Pasichnyy” is 2,500 apartments in which families and independent self-sufficient residents of Lviv will be living. Our residents are people of different age and interests. For young mothers there are children’s playgrounds and a parkland where they can walk around with children and breathe fresh air; for men’s community there are sports grounds, and for people of ripe age there are areas of rest where they can arrange long gatherings. For those who want to know the latest news and be in permanent connection with friends and relatives there is Wi-Fi on the whole territory of the residential complex, for intellectual people and those who adore reading there is bookcrossing, equipped places for book exchange between residents of “Pasichnyy”. “Pasichnyy’ is a new and interesting community, new friends and colourful emotions! For your cars we have built two modern underground parking areas with 140 parking lots. The parking area is open 24 hours and is always under security surveillance. Among other addotional services there is seasonal storage of auto tyres and bicycle parking. Underground parking areas are equipped with surveillance cameras, fire-fighting and smoke extract systems.